Junior outside center Aaron Jackson (left) and senior fly-half Conor Mendelson (right)on an offensive drive during the team’s match last Saturday. The Pioneers lost 62-12 and are in action Saturday at Fairmont State. 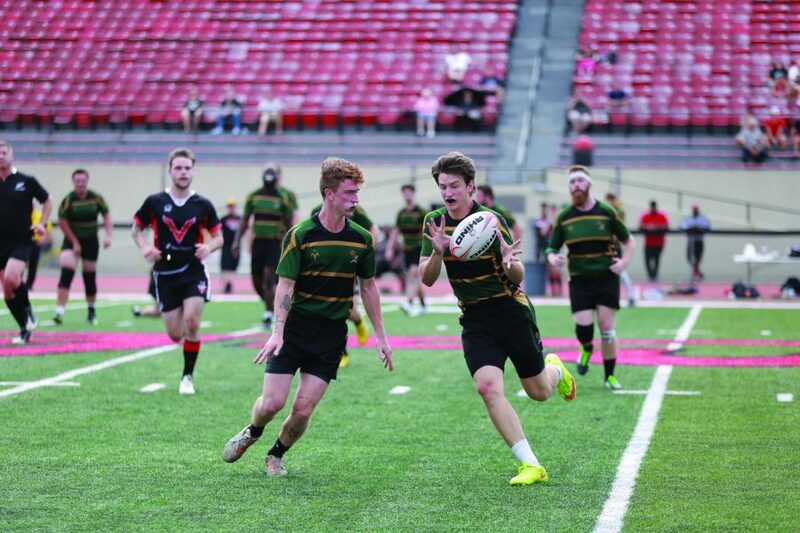 Coming into a game against a bigger team is nothing new for the Point Park rugby team. In fact, in the first ten minutes of the opening half against California University of Pennsylvania (Cal U), the Bison looked like they would use their shifty small size to outpace the Vulcans. Despite their grit, a deeper bench and bigger size was too much, as the Vulcans defeated the Bison 62-12 Saturday at Adamson Stadium. From opening kickoff, Cal U was on their heels. Several turnovers by the Vulcans allowed for the Bison to remain in control of the ball on the first drive. However, the defense remained strong with two goal line stops for Cal U. The Bison were able to power through on a third attempt, thanks to senior Zack Thrasher on a ten yard run. Senior Connor Mendalson failed to convert the extra point, as the Pioneers took a 5-0 lead. The Bison again took to the offensive after another strong push from the kickoff. The drive resulted in a scrum that the Bison again took possession, not leaving much room for the Vulcan offense. That was, until a fumble by the Bison lead to a huge breakaway for Cal U. A few well-timed passes by the Vulcans, and moments later they were at the Bison goal line. The Bison were able to regain possession at the two yard line and Aaron Jackson made a booming kick all the way to midfield to clear the defensive zone. This was possibly the turning point of the game for the Vulcans, as they returned the kick easily to the 11 yard line. The following play resulted in a Vulcan score, tying the game at fives after they failed on the kick. Halfway through the first half, being tied seemed like a good start for the Bison. The Vulcans took control of the game from that point on. Cal U scored four consecutive times after their initial score in the first half. At halftime, a commanding 29-5 lead for the Vulcans had the Bison struggling to come up with a defensive solution. The Bison also struggled without one of their key players, senior Noah Korey, as he was taken out of commission in the first half after an elbow injury. Korey was key for the Bison defense, and while senior Nate Smith replaced him and had a strong outing, it was not enough to fill the void left by Korey. The second half was more of the same for the Vulcans, as they scored just four minutes in to take a 34-5 lead. From then on, the Vulcans would score three more times to increase their lead to 50-12. The Bison defense was unable to stop the offensive powerhouse, and missed several key tackles in open field, as Cal U seemed to break through midfield with ease. The one highlight for the Bison offense, which had less than ten minutes of possession in the second half, was Jackson scoring on a 40 yard breakaway, making the score 50-12 after a Mendalson kick. The Vulcans would go on to score two more times in the final ten minutes to take the 62-12 victory. Despite the blowout, the Bison found some positives. “I think [Kepple] played a great game, he’s got my vote for man of the match,” senior Sam Allman said when he addressed the team after the game. The Bison head out on the road to take on Fairmont State this Saturday.